So pretty! And the dressing, SO delicious! Who knew that orange and cumin are such a magical combination?! Mache (pronounced "mosh" and accented with a little French hat above the 'a' which I can't seem to figure out on Blogger) is a fresh-tasting salad green, pricey but elegant looking so good for special occasions. But I'd recommend the dressing for other salad greens. It's REALLY good. FROM THE ARCHIVES ... 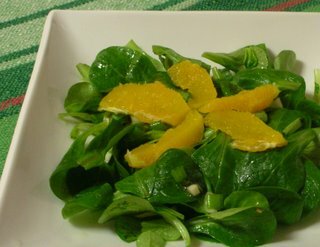 The Recipe Box has several good dressings for salad greens. Whisk dressing ingredients and toss with salad greens just before serving. Garnish with orange sections. Serve and enjoy! I agree about the massive amount of oil called for in salad dressings...what's up with that? I tend to like the vinegar-to-oil ratio to be around 1 to 1 at most, but usually more like 1.5 to 1 in favor of the vinegar. AK, thanks for the tip about baked goods! I hate cloyingly sweet cookies, and this tip will come in very handy. Do you find that you have to adjust the amounts of other ingredients to make up for the sugar, though? Jamie -- Plain red wine vinegar, must try that! Nupur -- Baking is supposed to be this scientific alignment of ingredients and heat and all that -- how many times have you been counseled to NEVER EVER toy with ingredients in a cake? But I don't find it true when it comes to sugar. I reliably cut the sugar in half although NOT with European-sourced recipes which are usually already less sweet. And there's no need to change the liquid, eggs, flour, etc. You don't 'have' to increase the "taste" ingredient but I do -- because with less sugar, you're looking for more 'something' and I'd rather have a cake that shouts 'banana' and 'cinnamon' say than a sugary cake with bare touches of banana and cinnamon. What I've found is that instead of one sweet thing after another, my kitchen yields a banana something and then a peach something and then a vanilla something, all different. I too cut oil in salad dressings, usually by about 1/2. That's a great tip for baked goods--I'll have to try it. I usually substitute white sugar with brown as I found brown sugar has an actual flavor. I'm still timid about playing around with baking, though. This dressing does sound really interesting. The orange dressing is exactly what I was looking for. I drizzled it over golden beets and Asian pears, perfect on a plate with a little lettuce and a vegetarian moussaka for my bookclub girls. Thanks so much ...!